Do you remember that persistent question you faced from a very young age? We are surrounded by a culture where the focus is on “appearances.” Who thinks about what a person can become? People are impressed by good looks, by how well you speak or how strong you are. How are we to help our kids combat this bias? By teaching them to look inside. Ah, but we learn that God doesn’t look at outside qualities, he looks at our inside, at our heart. What did God “see” in David’s heart? David is thought to have been between 10 and 15 years old when he was designated as Israel’s next king, but he didn’t take the leadership right away. David continued to care for sheep, building courage, a good leadership quality. David also wrote Psalms. We can look in his Psalms to find other seen-by-God heart characteristics. Bring out a Bible and read the following Psalms. Try to figure out the heart quality conveyed. 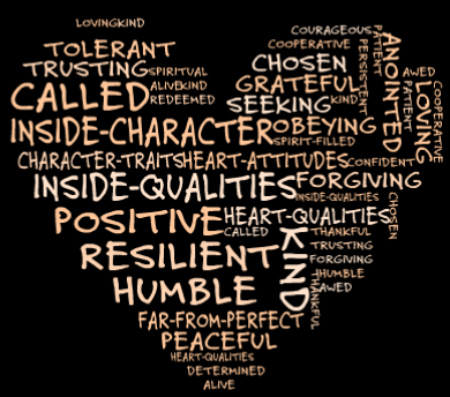 God sees these qualities and possibilities in each one of us; each person is important to God. God looks at who we can become. Discuss with your family about what heart-attitudes you see in each other. You may be surprised! Are their qualities you need to work on adding? Heart-shaped word art was created by moi, using Image Chef Word Mosaic.